Nashville “Cake Doctor” Bryn signs her newest cookbook, a collection of 125 guaranteed tried-and-true recipes for every occasion and money-saver tips, menu and serving suggestions, “Razzle-Dazzle” variations, do-ahead notes, and much more. Anne Byrn Saves the Day! Join us in welcoming Anne Byrn as she celebrates her latest cookbook with a delicious in-store tasting! A problem-solver extraordinaire, Anne Byrn (The Cake Mix Doctor) knows what every too-busy cook knows. There are a gazillion recipes in the word, but the right recipe that always works even when times are crazy—that’s priceless. "Anne Byrn Saves the Day! Cookbook" is a supercharged feast of 125 tried-and-true, easy-and-delicious recipes ready to rescue mealtime, including crowd-pleasing dishes that will make large holiday gatherings a cinch. Each recipe has a *razzle-dazzle* tip to save money, repurpose leftovers, set off ingredients, and give dishes that special pop! Anne Byrn | Unbelievably Gluten-Free! 7PM WEDNESDAY, JANUARY 30 Anne Byrn: Unbelievably Gluten-Free! ﻿﻿Frequent Good Morning America contributor Anne Byrn, better known to millions as "The Cake Mix Doctor," presents Unbelievably Gluten-Free! Dinner Dishes You Never Thought You'd Be Able to Eat Again. ﻿﻿For the 30 million Americans who have an allergy or sensitivity to gluten—and their families, who want to reclaim the dinner experience of everyone eating the same thing—Byrn creates 125 amazing dishes where the gluten is gone and never missed. She replaces wheat, barley, and rye with gluten-free ingredients, and employs creative techniques for achieving flawless textures and consistencies. These are recipes that taste as good—not "almost" as good—as they should: pizza, fried chicken, pasta, breads, dumplings, fritters, pies, cakes, puddings, salads, soups, and more! Includes how to convert favorite recipes and tips for eating gluten-free on a budget. ABOUT THE AUTHOR Anne Byrn is the author of the bestselling Cake Mix Doctor series and The Dinner Doctor, with over 3.5 million copies in print. She makes frequent appearances on Good Morning America and QVC. She lives in Nashville, Tennessee, with her family. Her website is cakemixdoctor.com. (28th St)Author Talk and Tasting with “The Cake Doctor”, Anne Byrn for her new cookbook, Unbelievably Gluten Free! 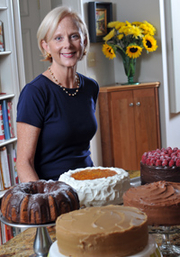 About the cookbook: Anne Byrn serves up comfort foods like fried chicken, pizza and of course… cake, all gluten-free! With Anne’s simple techniques, ingredients and gluten-free pantry staples, the dishes you love are back on the table, where the gluten is gone, and won’t be missed! About the Author: Anne Byrn is the author of The Cake Mix Doctor Bakes Gluten Free, and many other Cake Mix Doctor cookbooks. More information at cakemixdoctor.com. Anne Byrn, Unbelievably Gluten-Free: 128 Delicious Recipes: Dinner Dishes You Never Thought You'd Be Able to Eat Again. Anne Byrn on tour for The Cake Mix Doctor Returns!. Anne Byrn is currently considered a "single author." If one or more works are by a distinct, homonymous authors, go ahead and split the author. Anne Byrn is composed of 4 names. You can examine and separate out names.